Looking for a few ideas outside the box and to beat the crowds at the usual tourist sights? For those who decide to stay in Marrakesh for more than 4 days, there are some interesting options for spending relaxing days or even trying having a very strong olfactory experience...read on to understand. You can’t leave Marrakesh without having visited a hamman, either in your riad or one of the many spas such as the one in the Les Jardins de la Koutoubia 5 star hotel. This spa is sponsored by Clarins and offers a vast array of treatments. There are no doubts that this is among the cleanest and most hygenic spas in Marrakesh. Relax and let yourself be pampered! Of course, there’s even a Nikki Beach in Morocco. It is located a little ways out from the center in the Palmeraie area. This beach hot-spot is 15km from the the airport and easily reachable from the Medina in 10-15 minutes by taxi. As you may have learned, I love to go from one extreme to the other. This experience is not for the faint of heart, and I must warn those of you who have a hard time with strong odors. The tanneries are located on the eastern outskirts of the Medina in order to be in close proximity to the waters of the Oued Issil. Local guides are easily found as they tend to hang out near the tanneries, although, they may not be required. You’ll be struck by the strong smell of the skins, especially the excrement used to soften and lighten them. 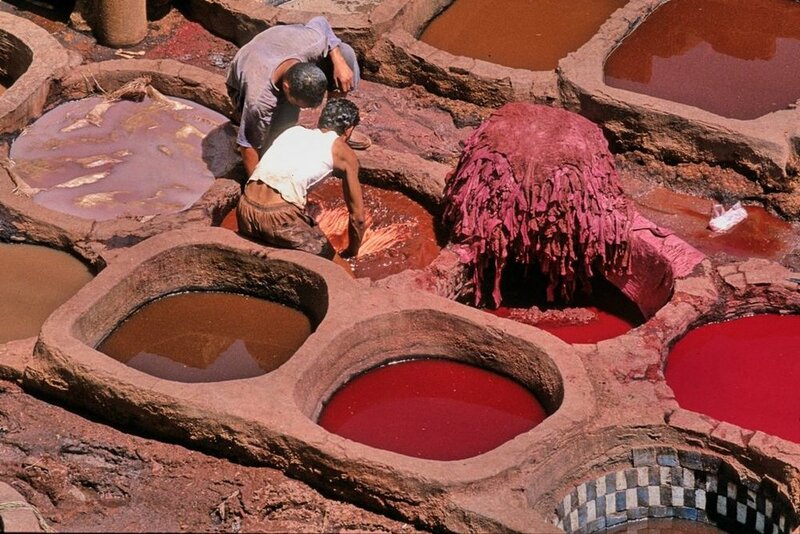 In fact, The processing and treatment is all very natural...the skins are immersed in pigeon excrement to soften them before proceeding to be colored using natural pigments from saffron and poppies. Once colored, they are put out to dry in the sun. The Palais de la Bahia (Bahia Palace) is, in my opinion, the most interesting palace in Marrakesh. The palace, built in a nouveau riche style, served as the former harem for the visir, housing his 4 wives and numerous concubines. Although there are no longer any furnishings, the opulent decorations and mosaics on the courtyard walls are worth the visit. The palace includes 8 hectares of gardens all interconnected by magnificent fountains. Entry is quite cheap at 10 dirhams, around one euro. Mellah, the Jewish quarter, is just steps away from the Palais de la Bahia. It’s not hard to see at first glance that this neighborhood is different than the rest. It is the poorest and least touristic area, as evidenced by it’s cleanliness and upkeep compared to Medina. Mellah is, however, famous for its spice market. Here you can find items at considerably lower prices than in the souk. Don’t miss the synagogue and Jewish cemetery! By now, you must have seen photos of the famous blue gardens of Marrakesh. These are in fact the Jardin Majorelle. The gardens are very touristy and anything but peaceful, however, its electric blue colors and blue majorelle are worth the visit. The Jardin Majorelle is located in the modern neighborhood of Gueliz, easily reachable by taxi or on food following Avenue Moulay Abdallah. Upon the death of Majorelle, already a famous artist, the gardens were purchased by Yves Saint Laurent and Pierre Bergé. This is the reason you will now find a memorial to YSL and a museum featuring traditional North African tribal arms, jewels, and leathers. The entry cost to the garden is 50 Dinars, exclusive of the museum. The souks, or suqs, are the typical covered markets that you can find scattered throughout the Medina. They are one of the main attractions of Marrakesh. As soon as you enter, you’ll get lost in the small alleys full of tiny shops, colorful stalls, exotic smells, sounds, and the loud voices of the merchants trying to tout their wares- all sure to leave a lasting impression on any visitors. Remember the golden rule in Marrakesh, NEGOTIATE for EVERYTHING! The market stretches from the Ben Youssef Mosque in the North to the famous Jemaa-el-Fna square in the South. It is organized into areas dedicated to specific goods and activities: leathers, wool, jewelry, produce, lanterns, apparel, dried goods, spices etc.. Take a break afterwards in one of the many terraces to sip on a mint tea and admire the sunset. Of the souvenirs available I suggest: some small bottles of argan or rose oil, spices (curry, turmeric, etc), the famous black soap used in hammam for a quick scrub or the iconic Morrocan slippers worn by none other than Aladdin. Jemaa-el-Fna square is the true epicenter of all the chaos that is Marrakesh. During the day, you’ll find snake charmers and stalls selling dentures (yes, you read correctly, dentures), street artists, monkey trainers, henna tattoo artists, horse drawn carts, and vendors selling dates and freshly squeezed orange juice. By night, the market makes way for stalls serving up fresh local cuisine. It is definitely worth trying at least once! Although there are seemingly an infinite number of stalls, they are all in fact numbered which is helpful to find specific ones. The most famous that I tried was the“Aicha N°1” read here to learn more! The square is dominated by the Koutubia mosque, the tallest in Marrakesh. A few steps from the mosques is the Cyber Jardin on Avenue Mohammed V, and L’Embsemble Artisanal, a sort of artisans quarter where prices are fixed and there is no bargaining. It seemed a little too touristy for my liking.